Do you have an old, dead tree that is just too unsightly to keep around? Call Edmond Tree to have us come out, evaluate, and remove it! We know that you love your trees and the shade that they provide, but every yard has that one visitor that just has to go. There are many reasons why a tree might need to be removed, so don’t feel bad! Whether your tree is rotted out, diseased, or just doesn’t fit in with what you’re trying to accomplish in your yard, we can help you out! 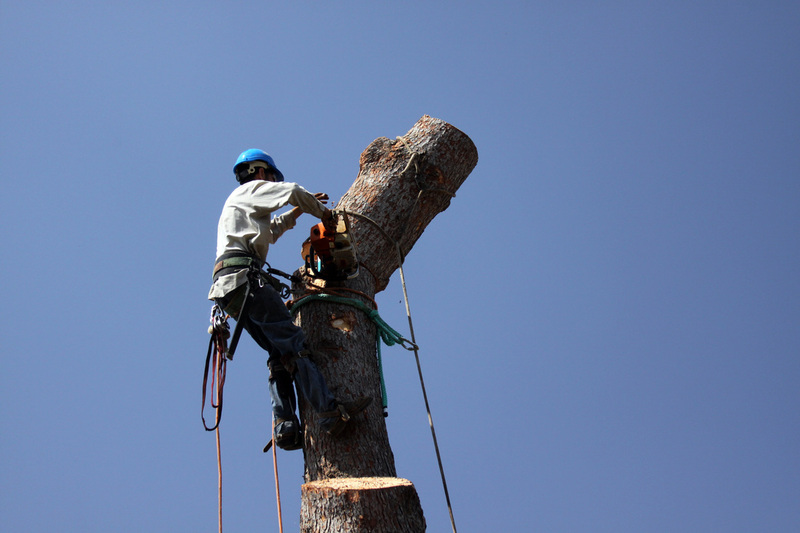 Our trained staff are knowledgable in safely removing trees in just about any situation that you can throw at us. Whether it is right up against your house, growing over your neighbor’s fence, or tucked way back in a hard to get to place, we can make it happen. Give us a call today at 405-562-5725 for a free consultation and quote on having your tree removed! Do you have an unsightly tree in your yard that you would like to see removed? Are you worried about overhanging branches falling on your home from a tree growing too close to your home or business for comfort? Has a tree on your property become damaged or diseased beyond repair? Edmond Tree is the right service for you! Our professionally trained staff at Edmond Tree will come out to your property to evaluate the situation in question and give you a fair assessment of the tree along with recommendations on the next steps moving forward. Then we will remove the tree for you! A beautiful tree can become a part of what defines your home or business. It may be difficult to imagine your property without your favorite tree. However, tree removal may be necessary due to a variety of factors. If a tree next to your house or place of business is old, decaying, and dying, you risk the tree or some of its larger branches falling onto your roof or the side of the building and causing serious damage. A storm can mortally injure or topple a tree resulting in the tree being beyond repair. Tree roots can pose a serious threat to the foundation of a house or building, warranting its removal. A large tree can be blocking the view from your home or hiding your business from the public eye, or it can be casting too much shade, consequently hindering the growth of your lawn. If your tree has become diseased, the tree may be subject to death, or the disease can spread to other trees. The trees on your property may even be too congested and need thinning out ensuring proper growth. Whatever the reason you have for needing a tree removed, the experienced professionals at Edmond tree can safely remove it. It is extremely risky to attempt tree removal on your own. Tree specialists have seen and removed many species of trees from multiple situations, and they will bring along the best equipment for the job to remove trees safely in the most efficient manner possible. An arborist will have on hand the equipment necessary to mitigate tree care such as removing those pesky branches overhanging your neighbor’s fence. It is not always necessary to remove trees. Our staff will evaluate your property and give our honest judgment on which trees we should remove and which trees are an asset to your home. Keeping the trees on your property healthy and vibrant is a sure fire way to creating a beautiful space to live. Trees properly spaced from your home can provide the same measure of shade, beauty, and pleasure as did a tree too close to your home that needed removal, with the added reassurance that your home or business is free from danger. Whether your tree hangs over a nearby fence line, is a nuisance because it drops seeds and sap, or grows in a hard to reach location, Edmond Tree has the skill set, experience, and knowledge remove it safely.